Eastin Hotel Penang is rolling out a new buffet theme this year. 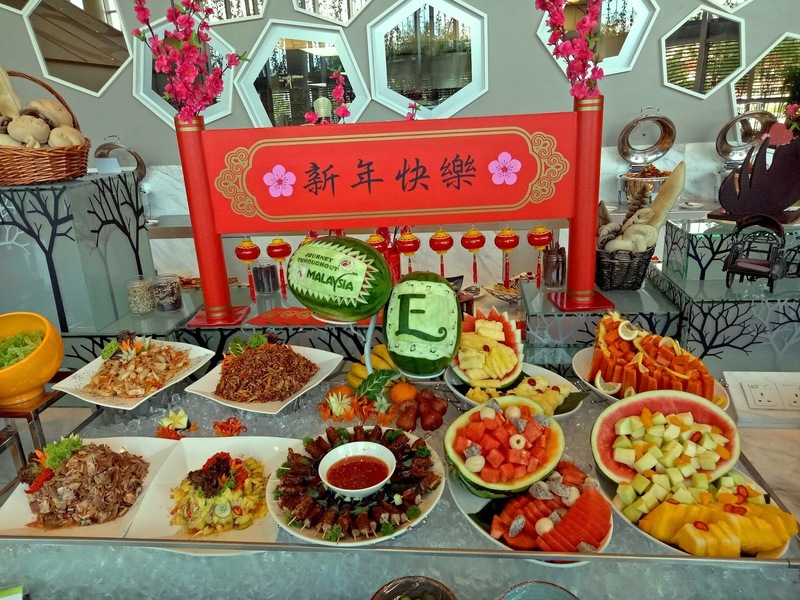 Held every Sunday at Swez Brasserie, the "Journey Throughout Malaysia" buffet lunch offers a variety of local dishes that Malaysian know and love. 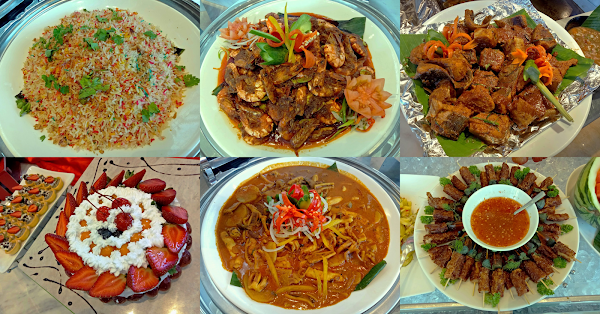 The menu's diverse cooking styles reflect the multiethnic makeup of the Malaysian society. Ulam-ulaman is a popular Malay salad especially in the countryside. It consists of raw vegetables such as yardlong beans, okra (lady's fingers), cabbage, cucumber and tomato. 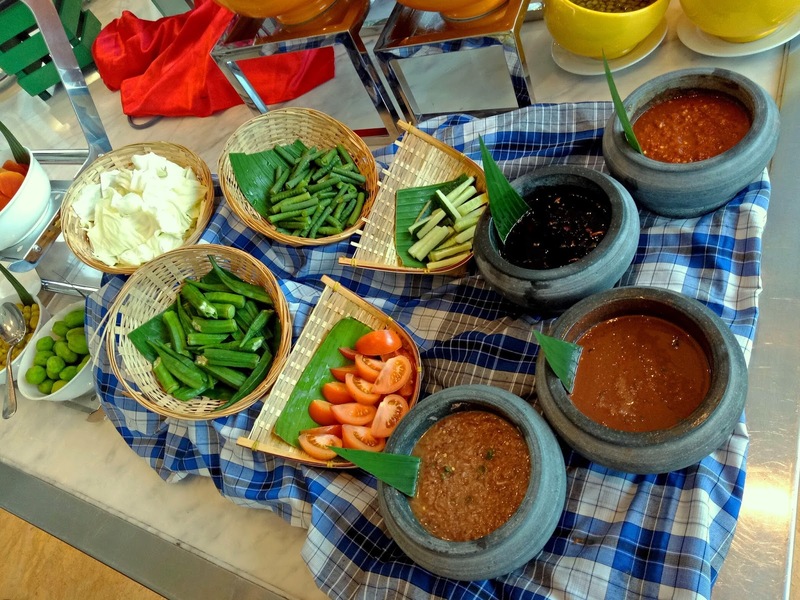 The vegetables are often taken with powerful condiments like budu (fermented anchovies), cincalok (fermented shrimps), sambal belacan (spicy shrimp paste) and sambal kicap (spicy soy sauce). Also prepared today are a handful of Malay salads, namely acar jelatah (cucumber & pineapple salad), kerabu ikan (fish salad), kerabu jantung pisang (banana flower) and kerabu ikan bilis (anchovy salad). Still on the topic of salads, Penang Rojak comprises of cubed fruits including mango, guava, pineapple, rose apple (jambu air) and cucumber. 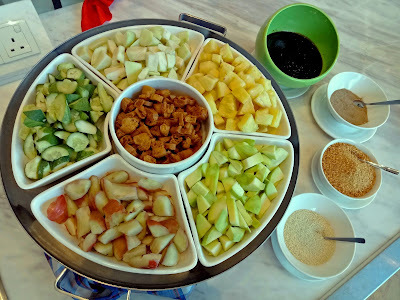 The fruits are dressed with thick rojak sauce with the help of a mixing bowl. Additives like crispy fritters and crushed peanuts help to improve the overall mouthfeel. Chicken Lobak is made from minced chicken and five-spice powder (五香粉). Wrapped in tofu skin, the rolls are deep-fried such that the skin becomes very crispy. 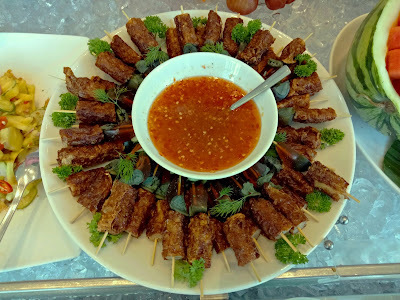 Presented on skewers, the lobak (卤肉) is also served with century eggs (皮蛋) and sweet chili sauce. Nasi Hujan Panas uses basmati long-grain rice, which has lighter texture than jasmine rice and is not so surfeiting. 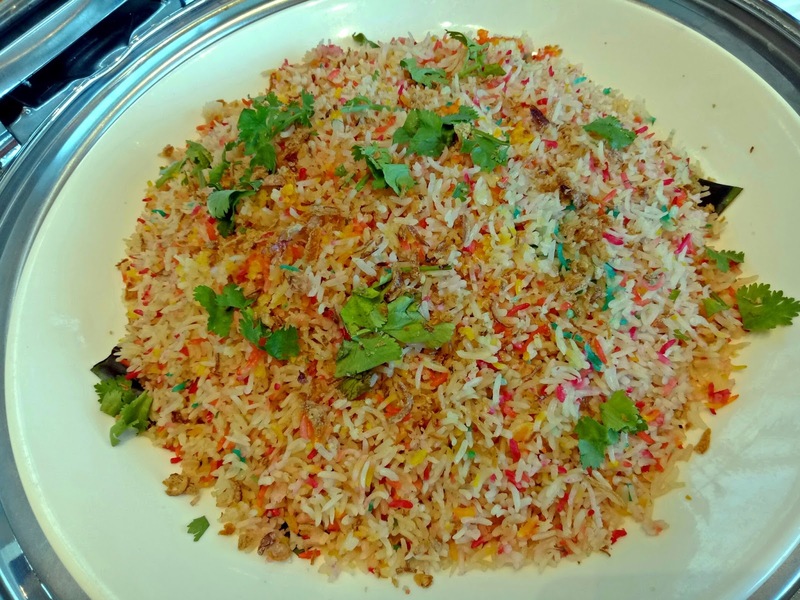 This dish is visually appealing as it uses rice grains of various colors, giving an illusion of colorful raindrops. The rice is cooked with ghee and is garnished with coriander and fried shallots. Despite being a Minangkabau recipe, Daging Rendang Minang enjoys widespread popularity by the mainstream palate. 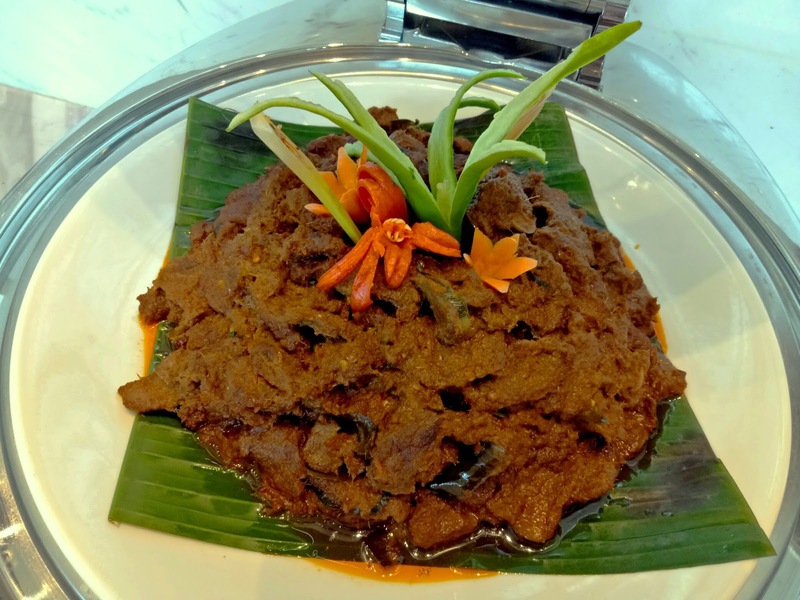 This savory dish is prepared by slow cooking beef with coconut milk and spices. 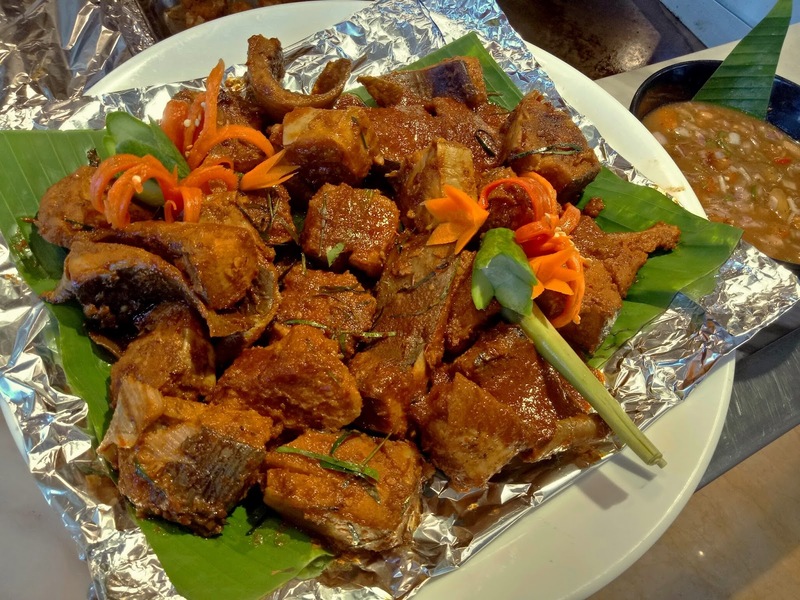 After most liquid has evaporated, the resulting dish attains an extremely rich taste. In fact, this is one of my favorite dishes during today's lunch. As for Sambal Udang Petai, medium-sized shrimps are cooked with sambal (chili paste) and petai (stink beans). 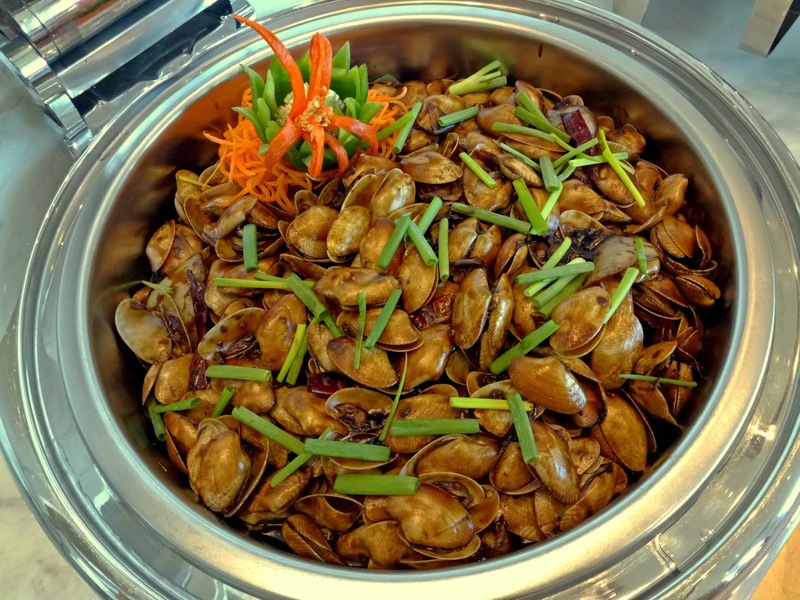 While the overall taste is acceptable, I prefer the petai to play a more prominent role. Moving on, Curry Squid is cooked with bamboo shoots to present a mixture of rubbery and crunchy textures. The accompanying gravy contains a substantial amount of coconut milk. 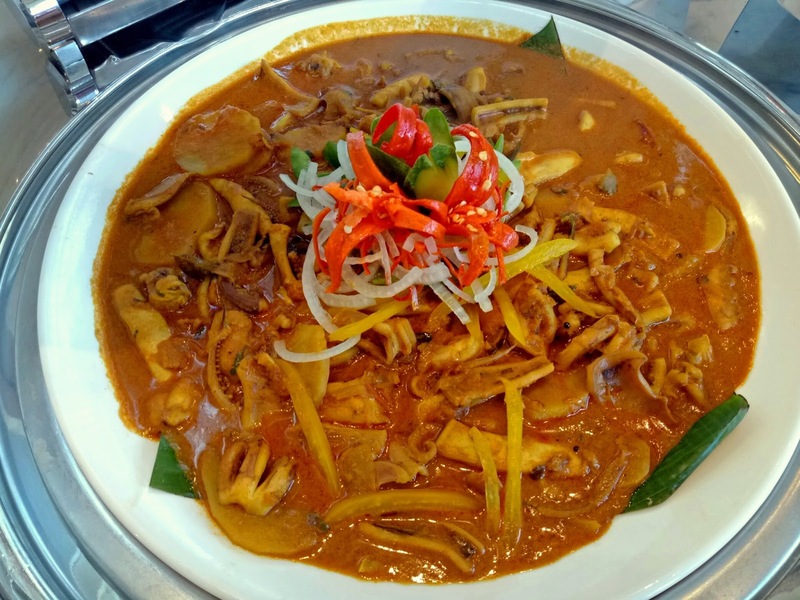 Lala Masak Cili is cooked with dried chili peppers for the fiery aroma. Unfortunately, the clams have very little flesh. Therefore, I think it is better to use mussels instead. At the action counter, the main highlight today is Ikan Bakar Padang. The choice of fish is stingray (ikan pari). 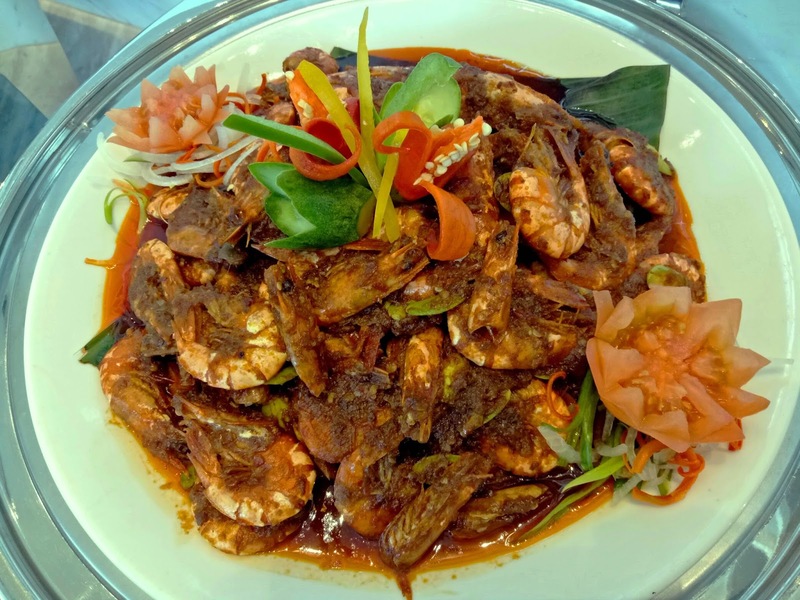 Marinated with spices, the fish is cooked on a griddle and is served with air asam (tamarind sauce). Other dishes at the action counter are cucur bawang (onion fritters), fried wanton noodle, popiah basah and cendol. The salad bar presents fresh ingredients such as lettuce, cabbage, capsicum, cherry tomatoes and more. 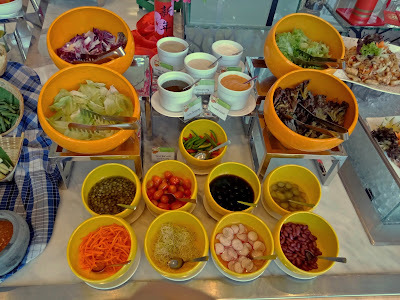 Salad dressings include French, Thousand Island, pesto, honey mustard and vinaigrette. Two types of soups are prepared today. Crab Rasam (நண்டு ரசம்) is a south Indian concoction that uses brown crabs, tamarind juice and other spices. 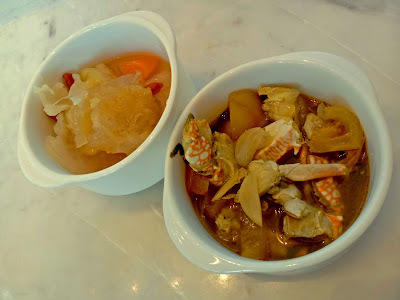 Meanwhile, Fish Maw Soup (鱼鳔汤) is relatively milder and is often served in Chinese banquet dinners. Both soups are very appetizing. Like my previous visit, I am wholly impressed with Eastin's soup recipes. 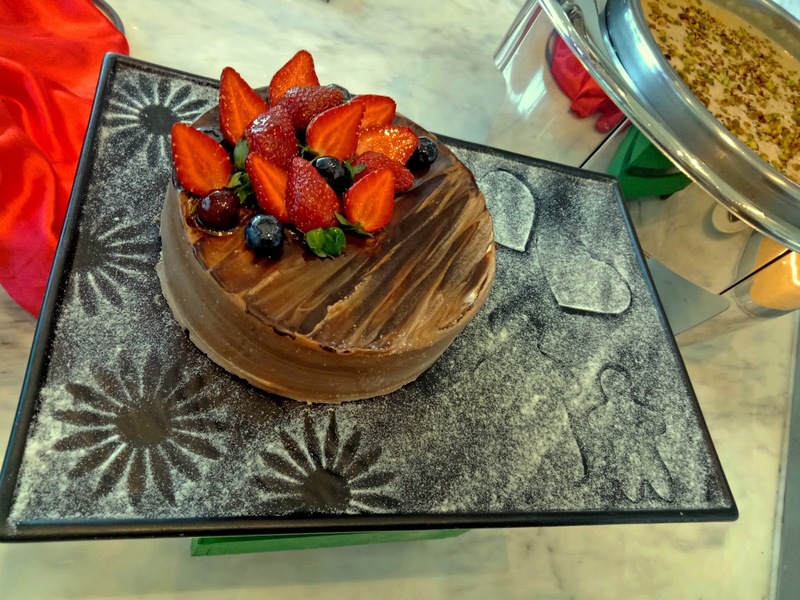 Moving on to desserts, the chocolate cake is topped with strawberries, blueberries and cherries. The cake is presented on a serving tray, which is dusted with fine icing sugar to enhance the cake's aesthetic appeal. 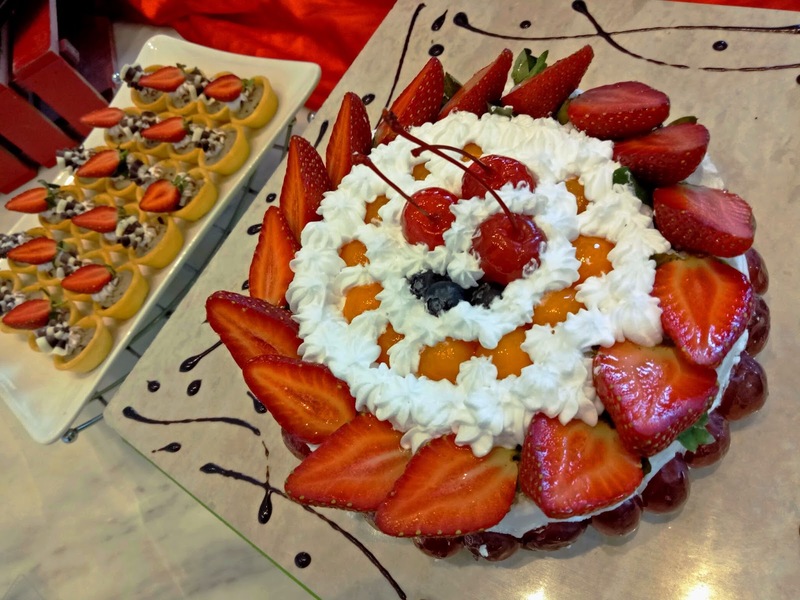 Next, the fruits cake contains a variety of fruits like strawberries, blueberries, cherries, red grapes and peaches. The elaborate icing on top makes the cake very attractive indeed. As for traditional Malay kuih, the pastry chef has prepared puteri ayu, kuih kosui and kuih sagu today. 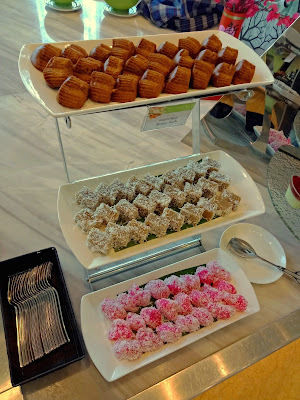 It would be nice to also see several Nyonya kuih being thrown into the mix. The Chinese pancake (煎饼) is filled with sweet bean paste (豆沙). In my opinion, there should be more filling in proportion to the amount of flaky pastry. 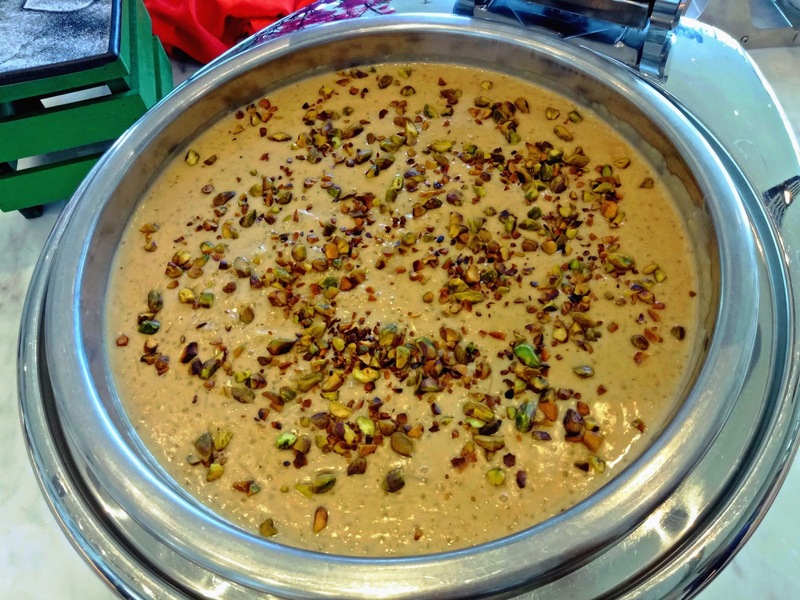 Last but not least, Payasam (பாயாசம்) is an Indian rice pudding that is made from rice, milk, sugar and spices. 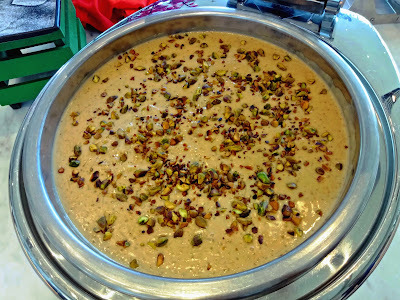 Crushed pistachios are sprinkled on top of the thick emulsion. I feel that the Payasam is too sweet for me, so it is not really my cup of tea. 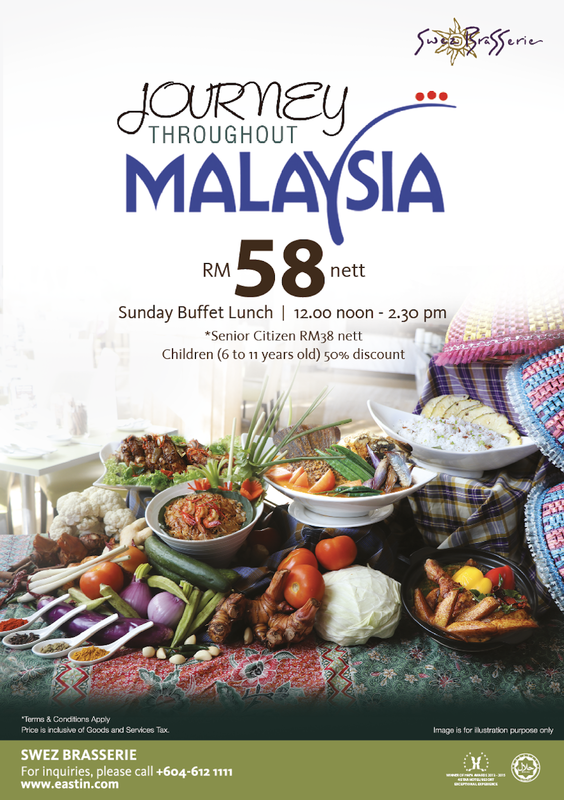 The "Journey Throughout Malaysia" lunch buffet is held every Sunday from 12:00pm to 2:30pm. 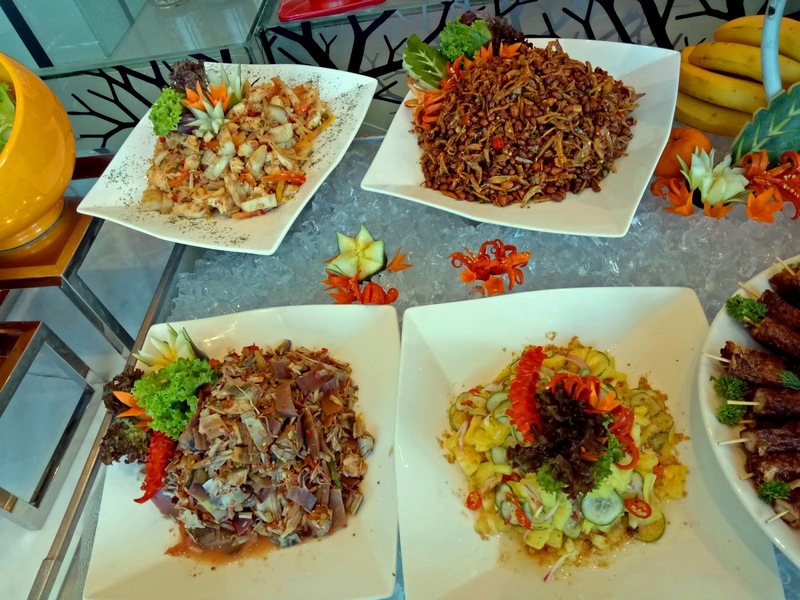 There are 4 rotating menus, so most dishes are different from week to week. 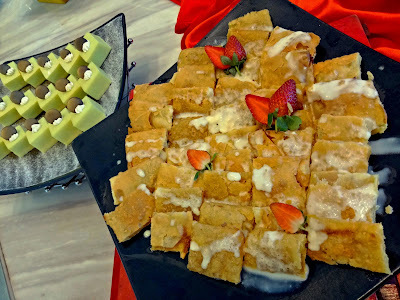 The buffet is priced at RM58.00 net per adult. Senior citizens and children enjoy discounted prices of RM38.00 and RM29.00 respectively.